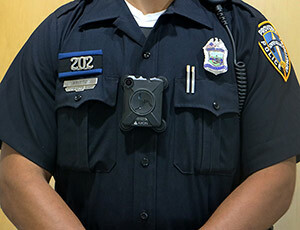 Providence, RI– The Providence Police Department announces the implementation of body-worn cameras (BWC’s) for all officers serving within the patrol bureau of the department. Officers will begin training throughout the month of October and BWC’s will be fully operational in the field within 8-12 weeks from the start of training. Axon 2 Body Worn Cameras are being utilized by the PPD to help contribute to officer safety, provide evidence for criminal prosecutions, assist in resolving citizen complaints and to foster positive relationships within the community. The privacy and safety of the Providence community will not in any way be compromised by the use of these cameras and requests for video related to police interaction will be screened within the perimeters of the RI Access to Public Records Act (APRA) set forth by the RI Department of Attorney General and also in cooperation with the Providence City Solicitor’s Office. BWC’s will be worn directly on the officer’s uniform, in the center of their chest and in plain sight to the public. The camera is a square shape and officers will be required to activate their BWC’s when responding to most calls for service or official activities that occur during their scheduled tours of duty or detail assignments. When officers respond to incidents where a reasonable expectation of privacy exists, for either the officer or a member of the public, officers will be generally prohibited from activating their camera or continuing to record. Learn about the Body-Worn Camera Program policy here and see photo attached showing the placement of the camera on officers. About AXON International, Inc. AXON makes communities safer with innovative public safety technologies. Founded in 1993, TASER first transformed law enforcement with its electrical weapons. TASER continues to define smarter policing with its Axon brand which includes a growing suite of connected products and services from body cameras and digital evidence management tools to mobile apps. More than 168,000 lives and countless dollars have been saved with TASER’s products and services.